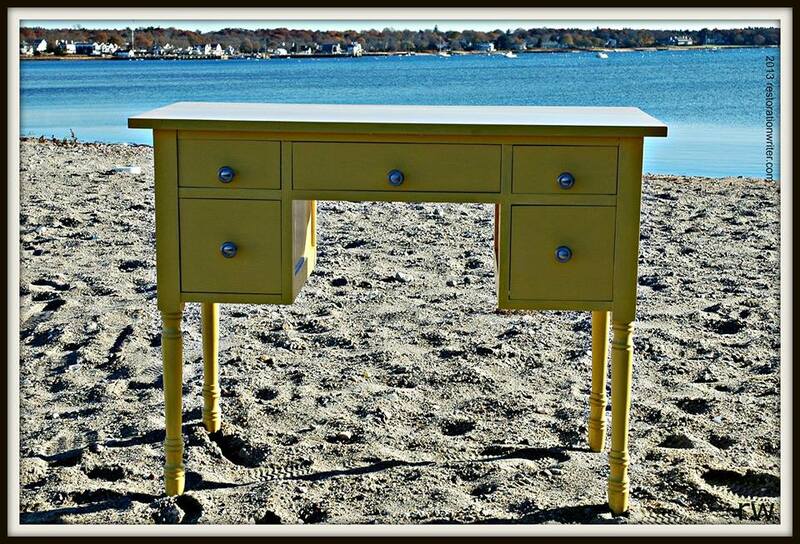 Even a tomboy needs a vanity, right? OK, so I don’t exactly fall in the category of a tomboy but I am definitely not one to spend a lot of time getting ready … for anything really. But for some reason after we bought our house more than a year ago, I haven’t been able to shake the thought of a vanity table. After months of searching (and refusing to buy something that was intended to be used as a vanity), I finally found the perfect one and she is a beauty! I found this old desk at a yard sale and I had to have it–at 38″ wide it would squeeze right into the window nook in our bedroom. The $23 price tag (after negotiation) on the desk was a bit more than I wanted to spend but after discovering dovetailed drawers and windsor legs, I knew it was worth it. The first thing I did was remove 2 supports that had been screwed in below the top of the desk (for the life of me, I couldn’t figure out why they were added. The desk is solidly constructed and the supports took away from the clean lines of the desk). After removing the wooden knobs on the drawers, I sanded the entire desk to remove any old varnish and to smooth the surface. 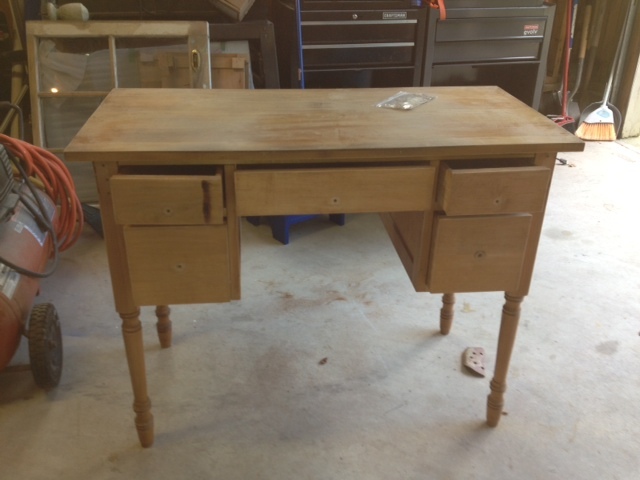 The woman who sold the piece to me explained that the holes on the front of the desk were left by a previous owner who had attached a fabric skirt to the desk (again, why??). 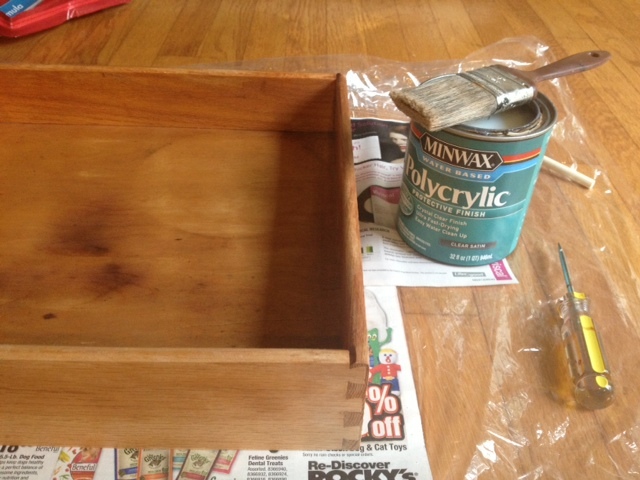 I used wood filler to fill the holes–allowing it to dry before sanding and then refilling. It took 3 times because the holes were pretty deep. 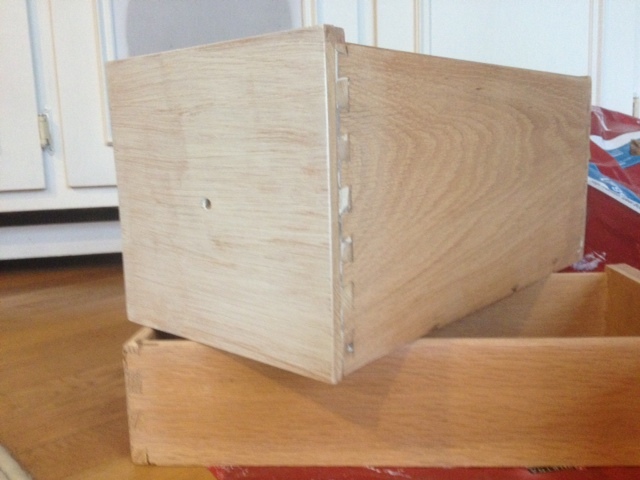 Once the dovetails were smooth, I used a cloth to remove dust from the inside/outside of the drawers before sealing them. I prefer to use Minwax Polycrylic for this step. I have used many different products and find this to be the best–it is water based so it’s easy to clean up spills and comes right off the paint brush. When applying as a finish, it’s best to apply very thin coats and allow to try completely in between. This is a case where more is not better. You can sand between steps if you like but I generally find this is not necessary. Previous story Best Way to Find Cheap Furniture? Go for a Run! Hi there. 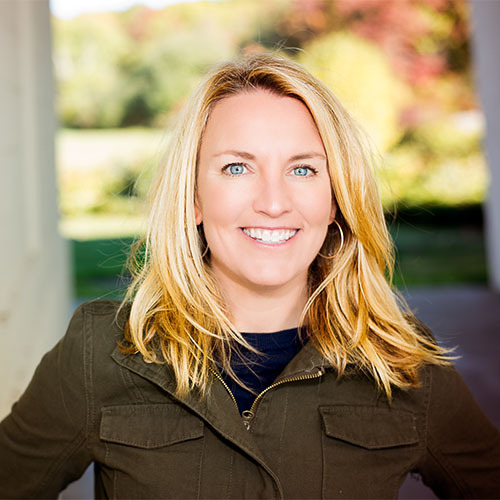 I'm Rebecca, a freelance writer by trade who relies on other creative outlets to restore my mind and fuel my work. Restoring old furniture and finding new purposes for everyday items requires a methodical process that allows me to refocus my story ideas. I restore to restore, it's as simple as that. Restoration Writer © 2019. All Rights Reserved.